Photo: A young farmer from Igingilanyi village in Tanzania involved in ACDI/VOCA’s Feed the Future-funded NAFAKA activity sorts Quality Declared Seed (QDS) to be sent to a warehouse. Today, many labor markets are shifting from traditional to digital with the rise of globalization and digital innovation. But not all youth want to leave their homes to migrate to urban areas for work in technology sectors. For many young people living in developing countries, agriculture is still a viable and often more suitable option when the right opportunities exist. 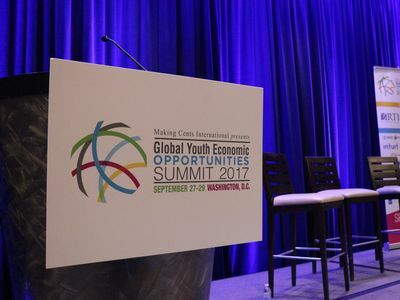 The idea that youth have no interest in agriculture is just one of the misconceptions explored during the 2017 Global Youth Economic Opportunities Summit on September 27-29 in Arlington, Virginia. The event brought together more than 450 stakeholders from over 50 countries to explore how global trends are affecting young people in developing contexts. Morgan Mercer, a gender and youth specialist for ACDI/VOCA, presented on a panel about youth employment, sharing insight from a Leveraging Economic Opportunities (LEO) report completed by ACDI/VOCA. The report looked into youth engagement in agriculture across 19 Feed the Future countries and, surprisingly, found that many Feed the Future programs do not specifically target youth. Despite this, youth in Kenya’s arid lands, for example, are still engaged across the agricultural value chain, as evidenced by the 80 to 90 percent who held positions in on-farm activities. Many others worked in off-farm activities, such running businesses selling inputs to farmers, Mercer said. Given their interest in technology and stake in protecting the environment, these youth are well situated to fuel the demand for sustainable agriculture productivity. Deep dives into four countries, including focus groups with 207 young men and 177 young women, revealed that intention matters when it comes to engaging youth in agriculture. Otherwise, youth involvement may be left to chance. In Nepal, for example, adults often brought their older children to trainings when they thought the topic, like technology, aligned with their interests and skills. This allowed youth to engage in intergenerational learning and mentoring around agriculture. 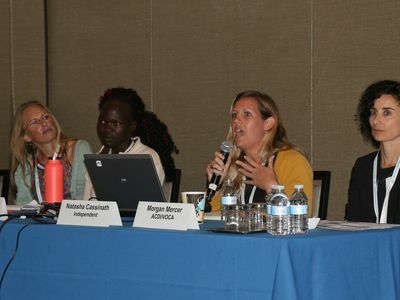 Photo: Morgan Mercer (second from right), of ACDI/VOCA, and Natasha Cassinath (right), an ACDI/VOCA consultant, speak at the Global Youth Economic Opportunities Summit 2017. Natasha Cassinath, a consultant on the LEO study, addressed other misconceptions, such as that youth want to migrate to urban centers and that they need to earn money quickly. On the contrary, she said, most youth involved in the Feed the Future programs come from families that have worked in agriculture for generations. These youth hope to follow in their families’ footsteps. More than fast money, Cassinath added, youth need better access to agricultural markets to see their potential.